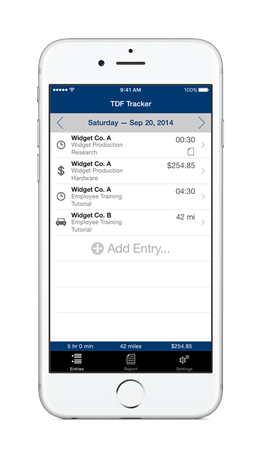 TDF Tracker | Technical Data Freeway, Inc.
TDF Tracker is a simple yet powerful tool for individuals who require time, expense, and mileage tracking. Potential users include anyone needing a flexible iPhone/iPad tracking system – consultants, lawyers, accountants, contractors and freelance designers, just to name a few. You could buy one app for your iPhone and use it to keep track of billable time, another app to track mileage for reimbursement, and yet another app for tracking reimbursable expenses – but if you are looking for the simplicity of one app to track all three and truly save you time then TDF Tracker is the best choice. easy reporting system which allows you to quickly send a custom day, week, or monthly report via HTML and/or CSV. If you are an existing user and have a comment or suggestion, please visit our feedback page. Your feedback will help us as we prioritize future features – and we love to hear new ideas that would help make TDF Tracker even better!